Months after Eric and I began dating we started traveling together. Trips to one of our cabins turned into out-of-state ski trips and those trips became international adventures as we celebrated our 6-month anniversary in Panama and Colombia visiting friends. Getting married only intensified the desire to see new places together as we set off for Croatia on our honeymoon and a year later to Paris, Belgium, and Spain. The only problem was as much as we enjoyed these trips they always ended too quickly. Our standard two-week vacation could hardly satisfy our desire to be together out in the world. After friends of ours hatched ideas to travel around the world and another to bike from Alaska to South America, we closely followed along on their adventures from our computer screens. When they returned and were rehired back into successful careers, we began to question if we should follow on similar paths. Through many bottles of wine we questioned the ideas of this trip from every angle and decided it was a trip we had to take. We started aggressively saving everything we could and started to plan. We have a rough plan – to start in the San Juan Islands where Sarah’s family has a cabin and then to head down to South America. Once we spend half of our funds we’ll head to Asia to spend the rest. The rest of this adventure will be to not follow our usual vacation goal to plan every activity, sight and hotel, and to instead to stay where we enjoy and to follow recommendations on the ground. The first real adventure we went on was in Elementary School, when my mom pulled my younger brother and I out of school and took us to live in France while my dad attended a business program at Harvard. We spent a month in school, living in a house in a very small town, and another month on the road with family friends – all of us fitting in my mom’s Volvo Station Wagon. Once my dad’s program was over, we traveled a lot as a family to Club Med’s, hiking in the Alps and on another trip along the Inca trail in Peru. These international travels came between typical trips around the US, seeing Hawaii, New Mexico, California, Washington DC, New York and too many colleges across the country to count! While attending Willamette University in Oregon, I chose to study abroad and though based in Florence, Italy, traveled every weekend trying to see every corner of Europe. My brother Cory and I traveled back to Europe for a few weeks after my college graduation and we both had a goal: to find, and fall in love, with a European so we could get married and move to Europe forever. Weeks later we were back home, still single. Years later I was beyond lucky to meet Eric, who thankfully shares my love of traveling and has gently pushed me to go on this journey together. I love to cook, exercise, volunteer, and host parties, all of which I hope to continue while we are traveling. I’m currently training for a half ironman in July and will hopefully continue to run and bike while we are on the road. I was very fortunate to have parents that set off for an adventure to Switzerland after they were married. Their trip was only supposed to last six months, but they ended up living there for seven years and obtained their PHD's at the University of Geneva. My older brother Max was born there and lived the life of a Swiss boy until my parents moved to Seattle a few months before I was born. Their travels stories growing up were always something that encouraged and inspired me to follow in their footsteps. After Sarah and I had been dating for six months, my good friend Seth Berling offered a once in a lifetime trip to sail from Panama City to Cartagena, Colombia. He and his brother Parker were riding their bicycles, yes..bicycles from Prudhoe Bay Alaska to the most southern tip of South America. I spent a week plotting the perfect way to ask Sarah along for the adventure. To my surprise, I couldn't even finish my statistical analysis about how safe Colombia was before she said "yes!" I didn't tell anybody at the time, but thought, "This is the girl I want to marry". I was also advised from friends that Colombia isn't exactly the place one takes their girlfriend of only six months and to be prepared to be single or in love upon my return. Luckily the trip was a success and we continued on! Sarah and I met when I was living on a houseboat on Lake Union in Seattle. When I moved in, my Grandma Nancy sent me a copy of "Sleepless in Seattle" in hopes that I would find a beautiful intelligent woman paddling by on a Kayak. I was fortunate to meet Sarah through a series of friends instead of chasing down an innocent kayaker. It was at the houseboat where we fell in love. We spent many evenings on the deck BBQ'ing delicious dinners and dreaming about traveling the world together. She of course drove home promptly at 9pm each night. After a year of dating, I worked up the courage to ask Sarah's dad for her hand in marriage. I drove over to their house in Medina on my lunch break with the intentions of "dropping off a Christmas present". I was a little nervous that Sarah's mom would be home, increasing the stakes. Fortunately for me, I was greeted by only Bill. I believe we spent a solid two hours discussing and testing out their new back up generator. I of course, procrastinated long enough to watch Susan pull into the driveway. After a brief conversation, I asked the both of them if I could marry their daughter. They said yes. When discussing places to go on our honeymoon, we both knew that we wanted to go somewhere non-traditional. We were planning to go to Turkey until political tensions rose beyond our comfort level. I had visited Croatia with some friends after I graduated college and threw out the idea of island hopping up the Croatian coast. 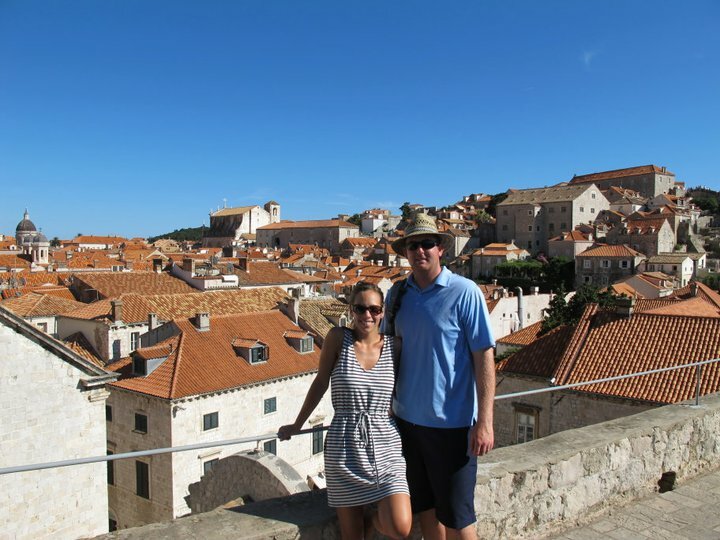 At the time and single, I stated that whenever I got married, Croatia was the honeymoon spot for me. Fortunately Sarah had also been before and we both booked our tickets. On the flight home, Sarah and I were already discussing the next place to visit. SE Asia, South America and Australia were on our radar. We unfortunately only had two weeks of vacation, which should be a crime in todays' world. Back to the daily grind in Seattle, we put our travel ideas on the back burner. We had wanted to visit Sarah's brother Cory in Brussels at some time while he was studying abroad there. It worked out that Sarah's parents and her nephew wanted to visit him as well. We planned a two week trip to Paris, Brussels and the coast of Spain over Christmas of 2012. At this point, my vacation balance was already running on fumes and had to take a week off without pay. Once again on the flight home, we talked about the corners of the world to see before we settled down. Kids have always been on our mind, but we both agreed that taking our kids around the world, didn't seem quite as enjoyable. Our choice was to wait until we retired in our sixties or quit our jobs and travel the world together without anything tying us down. The decision was made to quit our jobs in July, live in the San Juans for two months, travel to South America for 6-8 months and on to SouthEast Asia until our money ran out. We spoke to our good friends Jesse and Leonora about their experience traveling the world and took notes.